Read at least 20 review books this year. 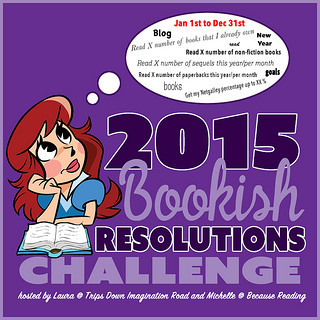 I read 54 review books so far this year, totally powned this goal! I keep adding books to the list as well though, so I am not really making a dent in my for review pile. Organize at least 30 tours with Lola’s Blog Tours. I organized 29 tours so far! Almost reached my goal! Good Golly! Nicely done there. I have a few similar goals. I wanted to read more Historical Romance this year and I’ve done well there. I wanted to take less review commitments- hit or miss on that one. I did well over the summer. I wanted to read more from my TBR pile and I have (the most in a year I’ve ever read from my TBR pile, in fact), but not as much as I should have. I wanted to watch how much time I spent on social media and I’ve done much better with that (timer works when I get on Pinterest or Facebook). I also resolved to stop reading if I really didn’t care for a book and I’ve done better this year. I am pleased with my efforts though I still want to keep working on my goals. Love seeing all your good work toward your goals, too. I really didn’t do well with the less review commitments, but I think I set that goal too low. Only 2 new reviews books each month just wans’t doable. I do read a lot of review books though, but I keep adding as well. Some days I can really get sucked into social media, although I try to avoid that, I think having a timer sure would beneficial at times. It’s nice to hear you’re doing well on your bookish goals as well. And indeed they do require constant work, but it’s nice to see the work helps and makes a difference. Yay, Lola! You’re doing so well with your challenges!! You should be proud of your accomplishments. Keep up the good work, my dear! Thanks Brandee :D. I just finished my tour goal today, yay! Now let’s hope I can ace that cozy mystery goal as well before the end of the year.